The Islamic Cultural Center of New York is a mosque and Islamic cultural center in the borough of Manhattan in New York City, United States. 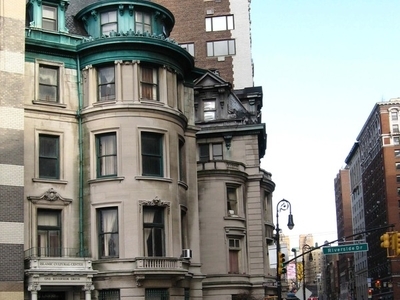 It is located at 1711 Third Avenue, between East 96th and 97th Streets. The Islamic Cultural Center was the first mosque built in New York City. The mosque's older dwelling in a townhouse at 1 Riverside Drive, is still in continual prayer use as a satellite location. 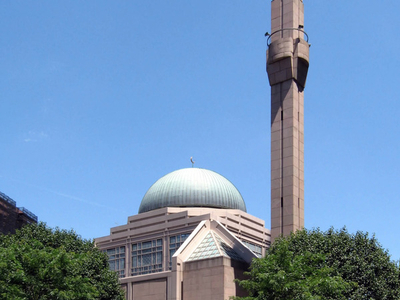 Like most mosques, the mosque at the Islamic Cultural Center of New York is oriented toward Mecca. Consequently, the building is rotated 29° from Manhattan's north-south street grid. which in turn is rotated 29° from due north-south. The precise calculation of the direction from New York to Mecca was based on the great circle that produces the shortest distance between the two cities. Here's the our members favorite photos of "Mosques near Manhattan". Upload your photo of Islamic Cultural Center of New York!